HARARE – A Facebook page purporting to be that of Elizabeth Macheka Tsvangirai, the wife of the main opposition leader Morgan Tsvangirai, is a ‘hoax’ according to a statement issued by his MDC-T party on Thursday. “We wish to place it on record that the page is fraudulent as Mai Tsvangirai is not on facebook. 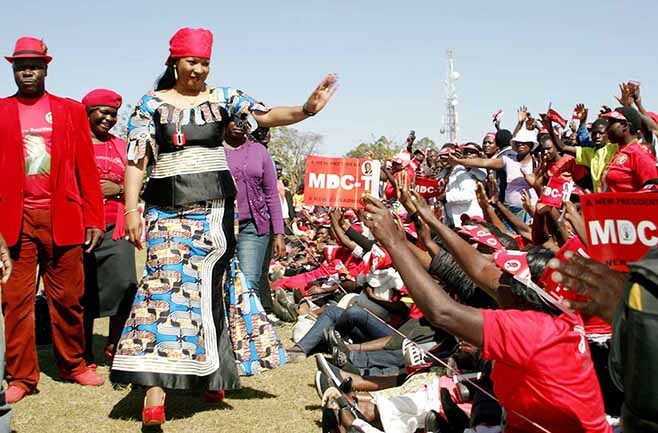 Someone is maliciously trying to abuse the name of the wife of the MDC leader by posting purported internal party information,” Tsvangirai’s spokesman Luke Tamborinyoka said. “For example, only today, the hoax page posted false and malicious information intended to damage the image and standing of MDC Treasurer-general, Mrs. Theresa Makone. “Most of the MDC-T members were buying electronic cards for $6 and getting the cards. But now the cards are somehow no longer being produced because the company is being owed $4800 for the 8000 cards that they produced. “$48 000 was raised and the party cannot pay $4800 for cards produced to date. A source in the card centre department confirmed that cards were not being processed. “It has been noted that there is gross misuse of money by Makone who once raised an invoice for a camera worth $5000! …for the information department. “A camera which she demanded to fly to South Africa to collect for herself because her deals would be exposed if someone else had gone.. $5000. And we think we can remove Zanu Pf with these type of leaders,” the page claimed. But Tamborinyoka in his statement said “Even under normal and ordinary circumstances, Mai Tsvangirai has nothing to do with MDC administration and can never purport to have any internal party information on anything of the party, let alone finance issues. “This notice serves to inform that the Elizabeth Macheka Tsvangirai page is not official and we are trying pursuing all options to determine the fraudster who is defaming people using the Tsvangirai name,” the statement read.